Rankings are for Class A Shares and are based on average annual total returns, but do not consider sales charges. Past performance is not a guarantee of future results. 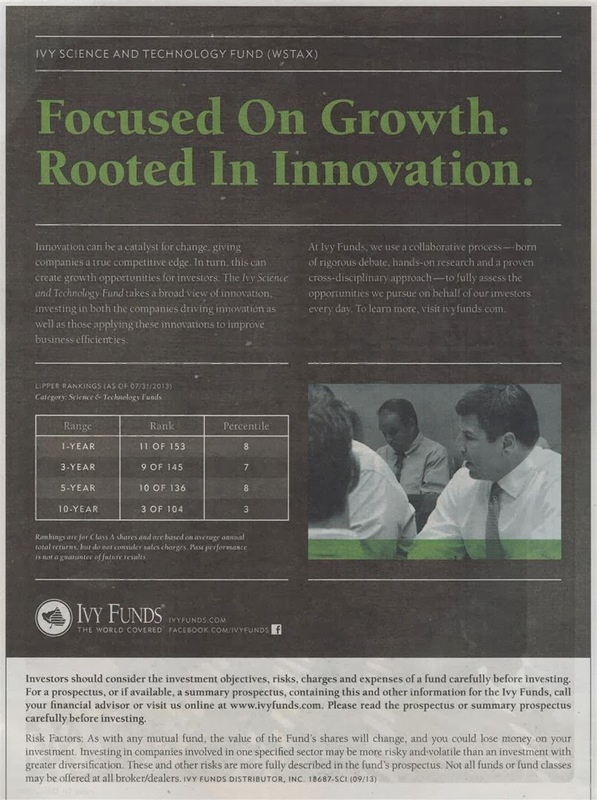 The fund’s objective is to seek growth of capital. This Ivy Science and Technology fund is ranked with 5-stars and Bronze rating by Morningstar. The total net assets are $3.9 billion. The CUSIP is 466000718. It is currently managed by Zachary H. Shafran. The annual expense ratio is 1.37%. The dividend is distributed quarterly. The annual holdings turnover as of November 10, 2013 is 43%. The top 5 equity holdings as of October 2013 are Micron Technology Inc (8.0%), Cree Inc (5.4%), Alliance Data Systems Corporation (4.8%), Aspen Technology Inc (4.2%) and Microsoft Corporation (3.6%). Information Technology is the top sector allocation (68.07%). Investing in sector fund involves risks. If you want to invest, invest not more than 20% of assets in this fund. Try to invest in no load fund such as Class I, or Class R.